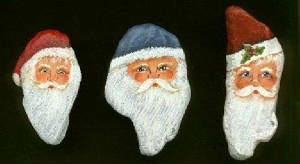 Betty started painting Driftwood Santas over 15 years ago. Local beaches provided the scraps of driftwood, and Betty used her imagination to transform each piece into a one-of-a-kind Santa pin or ornament. Lumps and bumps in the wood were fully utilized, sometimes resulting in Santa's comical protruding nose or a 3D toy in Santa's bag. Later, Betty had access to larger pieces of driftwood from Moosehead Lake and Alaska. She cut and sanded them to create the larger standing figures that became her more advanced works of art. 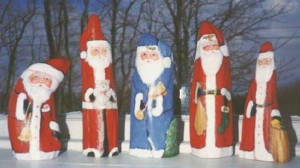 Many of her Santas have been featured at a popular gift shop in Camden, Maine. Please note that the items featured on this site are not for sale, but Betty looks forward to any comments you may have. Thanks for dropping by and taking a look at my artwork. Please get in touch with any comments or reactions! 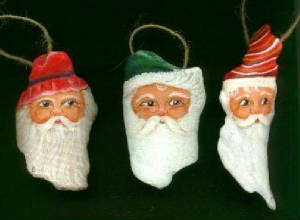 Betty's first creations were ornaments like these. She painted hundreds of them over the years to sell at local craft fairs and, of course, has given many as gifts. Is there a family member who does not have one on their tree?